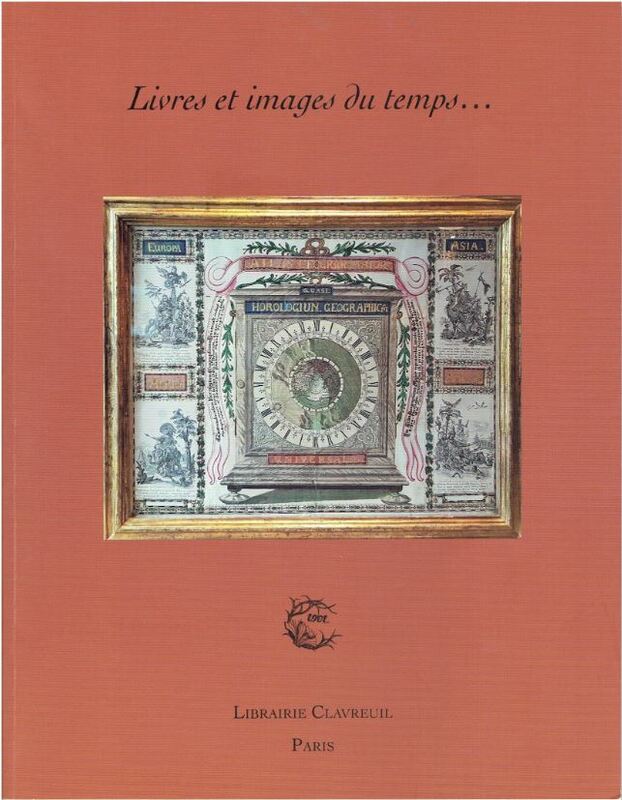 Librairie Clavreuil of Paris has issued a catalogue entitled Livres et Images du Temps... (Books and Images of the Time). This catalogue is written in French, as are most of the books, though certainly not all. Books cover a variety of subjects, but as the title suggests, they reflect their times. So they may describe what were then (usually two or more centuries ago) the latest advances and theories in science or medicine, law, economics, literature, along with French translations of then current foreign books. Here are a few samples of what you will find. We begin with an item that won't be within everyone's budget, it being the most expensive book in the catalogue. It may be a book, but it consists of 23 volumes, and it is a magnificent, large paper set of one of the most exhaustive studies of any country at the time, Description de l'Egypte ou Recueil des observations et des reserches qui ont ete faites en Egypte pendant l'expedition de l'armee francaise. In 1798, Napoleon, then a general in the army, led an expedition to capture Egypt. His aim was to seize the country as a base to interfere with rival Britain's trade with India. It also was an opportunity to show off his military prowess. However, Napoleon did more than just lead a military invasion. He brought along 147 scientists and others to do a thorough study of Egypt, including its natural history, antiquity, and everything else up to the present. Among their discoveries was the Rosetta Stone, the key to understanding otherwise indecipherable ancient writings. Unfortunately for Napoleon, while the invasion was successful, holding onto the country was not so easy. Along with confrontations with the British, they had to deal with the Turks, whose Ottoman Empire had controlled the land, rebellions among the native population, and disease. A year later, Napoleon hightailed it back to France, though we now know that this retreat did not hurt his long-term career. This enormous, detailed set about what the French learned in Egypt took many years to complete, the 23 volumes being published 1809-1813. Item 1. Priced at €400,000 (euros, or approximately $478,477 in U. S. currency). We next turn to the other end of the catalogue, item #126, for the second most expensive item offered. Rather than 23 volumes, this is a collection of 1,914 brochures of 2-12 pages each. This is a collection of the judgments and edicts of the Counsel of State for the King. They cover almost two centuries of French laws, from 1603-1789. They are, in effect, the legal history of the Ancient Regime, finally coming to an end at the time of the Revolution. There is much involving commerce, finance, the colonies, and more to be found in this massive collection. Item 126. €220,000 (US $262,941). Item 65 is an account of Victor of Aveyron, or the Wild Boy. Victor was a feral child, spotted in the woods for about four years, once brought to a home but escaped, who finally came to civilization around the age of 12. His background was never determined. He became something of a celebrity among the scientific and philosophical communities that struggled with what makes one human. Physician Jean Marie Gaspard Itard believed it was empathy and language. Unsuccessful attempts to "civilize" Victor ended with his coming to the home of Itard, who attempted to teach him, somewhat as he would teach the deaf and dumb. However, Victor clearly could hear, though he did not speak. Itard's first book displayed great optimism in his ability to teach Victor. By the time of this, his second account, Itard had concluded it would be impossible to teach him speech, that the effects of prolonged isolation at such a young age had irreversible effects. His second book, published in 1807, is Rapport fait à Son Excellence le Ministre de l'Intérieur, sur les nouveaux développemens et l'état actuel du Sauvage de l'Aveyron. Victor lived to be 40 but never progressed beyond primitive communication. While Victor's issues were primarily attributed to his living in the wild at the time, scientists today mostly believe he must have suffered from some mental issues, perhaps a form of autism, and his inability to use language was a result of this. They note that he could not have survived in the wild before the age of 5 or 6, during which time he would have been exposed to and learned language unless there were other issues. They reason he must have been abandoned at this later age, and that the scars contemporaries attributed to life in the woods may have been the result of mistreatment by family or others while young. €2,500 (US $2,987). In the early 18th century, most of North America was (at least in European eyes) possessed by France. A vast swath of land encompassing Canada, the Great Lakes, the Mississippi, and Louisiana, when Louisiana still covered the western side of the Mississippi all the way to Canada, were part of New France. That would all end with the conclusion of the French and Indian War in 1763, but was still the case when Pierre Francois Charlevoix visited America twice, in 1705 and again in 1720. Charlevoix was a Jesuit missionary, but he was also an explorer. On his first visit, he spent four years in Quebec. On his second trip, he was assigned by the French government to learn about the territory west of the Great Lakes and to see if there was a river route to the Pacific. He searched the area, eventually traveling all the way down the Mississippi to the delta, and finally to Florida. He inquired of the Sioux as to whether there was a route to the Pacific. He returned to France without a firm answer, but concluded that if there was one, it was via the Missouri River. That would be the route taken by Lewis and Clark a century later when they attempted to reach the Pacific. Charlevoix' account, not published until 1744, is found in his book, Histoire et Description Generale de la Nouvelle France... It includes what others had learned as well as his own experiences, three volumes covering both of his American visits. Item 20. €16,000 (US $19,276). Item 71 is a particularly fine edition of Jean de La Fontaine's fables, Fables choisies, ornees de figures lithographiques, de MM. Carle Vernet, Horace Vernet, et Hipolyte Lecomte. It was the first edition to use lithographic plates for the illustrations. There are 121 in all. Carle Vernet was brought on to provide the illustrations. He created 63 of the lithographs, his son Horace 19, and son-in-law Hippolyte Lecomte 34. This edition was published in 1818. €2,500 (US $3,013).